The Ikhana aircraft is flying a TAMDAR Edge probe that could significantly improve weather models and forecasts. 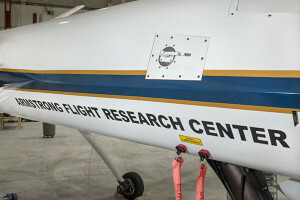 A weather probe that eventually will relay atmospheric conditions as they are unfolding and provide data to improve weather forecasts and models, has begun to fly on NASA’s Ikhana remotely piloted aircraft. The flights mark the first time that the Panasonic Tropospheric Airborne Meteorological Data Reporting, or TAMDAR, Edge probe system has flown on an unmanned aircraft system as large as the Ikhana, said Ed Diks, Ikhana deputy project manager. The Ikhana flights are based at NASA Armstrong Flight Research Center in California. “The weather information can benefit any kind of commercial or military aircraft and it could have uses for unmanned aircraft systems in the future,” Diks said. The TAMDAR Edge system is a miniaturized, lightweight version of the TAMDAR Edge probe that has been flying on commercial airliners for more than 12 years. Panasonic Weather Solutions and Armstrong have partnered under the Space Act Agreement to develop the technology to greatly enhance flight safety involving weather, Diks said. Ikhana pilot Hernan Posada sees the value in good weather forecasts. The full capability of the probe will begin later this year when TAMDAR and the Iridium communications satellite network will provide real-time weather to pilots and used to validate and improve weather forecasting models, Diks said. The TAMDAR Edge probe measures and detects real-time weather data including winds aloft, temperature, humidity, GPS position and altitude, pressure, altitude, airspeed, icing presence and turbulence, he added. “We will verify that we can transmit data and that the recipients of the data can read it,” he explained. “At the moment we have to land, download the data and then complete the analysis. The best operational use for the developers of the system would be to access that information whenever they want it and help develop weather models to make better predictions,” Diks explained. The benefit to aviation increases in remote areas without major airports that NASA Armstrong missions take place, where there is little or no local weather data, said Scott Wiley, a NASA Armstrong meteorologist. The TAMDAR Edge probe provides a way to provide weather data that is not available through traditional weather collection tools. The TAMDAR Edge probe seen in the middle of the NASA Armstrong Ikhana is flying on a large remotely piloted aircraft for the first time. TAMDAR data includes vital moisture readings, Wiley said. 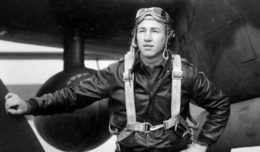 It also could have a role in NASA’s Unmanned Aircraft Systems in the National Airspace System, or UAS in the NAS. 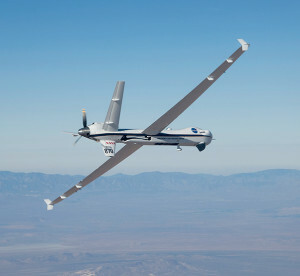 Weather observation is the primary use now and although the probe will be collecting data during upcoming UAS in the NAS missions, it will not directly contribute to that effort or have connectivity with the Iridium satellite network, Diks said. Another improvement to the TAMDAR Edge probe for NASA research is a heated probe, Wiley said. If a pilot encounters icing, the TAMDAR probe could be a backup detector. In fact, NASA Armstrong and NASA Glenn Research Center in Cleveland are considering working together to test the probe in Glenn’s icing wind tunnel to determine quantitative icing characteristics of trace icing, moderate icing or severe icing using the probe. The TAMDAR Edge probe also can tie into another NASA Armstrong research project, the Weather Hazard Alert and Awareness Technology Radiation Radiosonde, or WHAATRR Glider, Wiley said. WHAATRR gliders are envisioned as reusable radiosondes that could provide real-time weather data to mission managers and pilots.